Earlier today, Japanese researchers unveiled the latest incarnation of HAL, the Hybrid Assistive Limb. What makes this version of the suit particularly unique is that it is equipped with a network of sensors that monitor the electric signals coming from the wearer's brain, allowing them to seamlessly control the suit's movements. 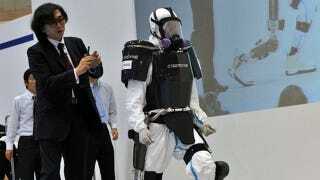 And because of its radioactive shielding, it's hoped that the suit will eventually be used by workers who are dismantling the crippled Fukushima nuclear plant. According to Cyberdine, the company that developed HAL (yes, for real), the sensors will be used to activate the exoskeleton's limbs in synchronicity with the worker's movements. And because the suit bears all the weight, the person wearing the suit won't feel any stress on their muscles. This is particularly pertinent for Japanese recovery workers, as they have to wear a 60 kg (132 lbs) tungsten vest while working in radiation zones — so this exoskeleton could certainly help. In addition, the suit features internal fans that circulate the air, while monitors keep track of the wearer's heart rate and breathing for signs of fatigue. While the HAL suit seems like it would be an incredibly useful, effective way to help those working at Fukushima, there still seems to be a big risk in wearing it. What if the suit should malfunction, or its power source run out, making the limbs impossible to move, or incredibly heavy. Then the wearer could become trapped inside and unable to get out of a difficult situation.